The Board will interview these candidates on May 2, 3 and 5. On May 5, the board will select candidates to move into second round interviews and also to meet with community representatives. In addition to these 6 candidates, the search consultants are continuing their efforts to directly recruit candidates. Those candidates, if they choose to apply, will participate in second round interviews with the Board and will also meet with the community representatives later in the month. As of April 22, 19 candidates have completed their paperwork and applied to be Worthington's next Superintendent. This excellent field includes current Superintendents from school districts in Ohio, Wisconsin, Michigan and Pennsylvania, candidates from large districts as well as smaller districts (including one from right here in Worthington) and candidates with diverse backgrounds and experiences. In addition, there are a handful of candidates who have started but not completed their applications so this list, while accurate as of this blog post, may grow. In addition to this list, our consultants are continuing to directly recruit candidates for another week or two. These recruited candidates, if they choose to apply, will meet with board members and community groups the week of May 16. Written Testimony on House Bill 136. Submitted to the House Education Committee. Chairman Stebelton, Ranking Member Luckie, thank you for allowing public participation in this process. My name is Marc Schare and I am the President of the Worthington City Schools Board of Education, however, I write to you as an individual taxpayer concerned that through House Bill 136, property taxes that I and other Worthington taxpayers voluntarily agreed to pay for a quality school district will be redirected away from the Worthington public school system and sent elsewhere. Let me start by saying that I believe strongly in School Choice and I believe wholeheartedly in the policy initiatives embedded in House Bill 136. In my experience, competition works every time it is tried and I think that competition will make public schools better. I also believe that most people in my community will choose a Worthington public school experience even if the private or charter school experience is free. My problem with House Bill 136 is primarily philosophical. I do not believe the State of Ohio has the moral authority to redirect local taxpayer dollars that are raised as the result of a voluntary property tax levy to an alternative provider. Under the funding formula contained in HB153, Worthington will receive approximately 12.35 million dollars in state aid and approximate 12.85 million dollars in TPP reimbursements in FY12, however, as the grade levels eligible for the PACT scholarships increase, our TPP reimbursement will decrease, eventually going to zero. When HB136 is fully phased in FY15 and assuming stable enrollment, we’ll be down to 19 million dollars from the state, inclusive of TPP reimbursements, or approximately $2000 per student. This proposal indicates that the value of a PACT scholarship is anywhere from $2313 to $4626 depending on income level. This means that proportionately, up to $2600/student receiving one of these scholarships will be paid for by local property taxes. A similar model applies to special education scholarships except that the local taxpayer contribution is dramatically higher. Asking my neighbors to increase their taxes to benefit my school district is not something that comes easy to me. When a community makes that choice, it is simply not right to have those dollars ripped away from the cause which justified the tax increase and sent elsewhere, and I say this while agreeing that in many cases, the “elsewhere” may be a better option for the child and the family. It would be as if this legislature took dollars from a local police levy and used those dollars to fund home security systems. They might do a better job for some people, but that isn’t why the money was generated in the first place. I’ve heard the argument that this is fair because the public school district no longer has the responsibility to educate the child. If Worthington spends $12,000 per student and the state takes $4,600 but removes the student, I should be $7,400 to the good. The argument is incorrect because removing a student here or there does nothing to reduce my fixed costs. If all students receiving special education or PACT scholarships were in the same part of my district and I could reduce staff or close a school, the argument would be correct, but they are not. Just as adding a student does not increase my fixed costs, decreasing a student does not help my bottom line. I’ve heard the argument that this is fair because my neighbors voted their tax dollars to educate the children in the community and those children are still being educated with those tax dollars. Most levy campaigns are run using a variation on the theme that a strong public school district maintains strong property values and that there is some inherent benefit to living in an area with strong public schools even if you don’t have children using those schools. Most campaigns also use an explicit or implicit threat that items that a community values such as busing, extracurricular activities and so forth are at stake. No campaign ever has or ever would make an argument that the local money is needed so that your neighbor’s kid can go to a private or charter school. I hazard a guess that most levys would not be successful using that tactic, yet, HB136 would have exactly that result. Members of the committee, the legislative session began with HB30, a bill that promised to repeal some of the recent unfunded mandates inflicted on school districts. I submit to you that HB136 is a huge, unfunded mandate that dwarfs any savings I might get from HB30. In summary, I applaud the policy objective; however, I believe that if the state wants to mandate PACT and/or Special Education scholarships, the state should pay 100% of the cost of those scholarships. You can accomplish this with one minor change. If a student accepts a PACT or Special Education scholarship, do not add that student to the public school districts ADM and have the state pay the provider directly rather than using the public school district as a middleman. I thank you for taking the time to read my submission and if you have any questions, please feel free to contact me at the phone number or email address listed above. Ohio's Next Budget - Part One. Budget watchers all know that the budget is a four part process. First, the Governor will submit a budget to the Ohio House of Representatives. The House will eventually modify the proposal and send it along to the Senate. The Senate will further modify the proposal and either gain concurrence by the House or a conference committee will be formed to work out the differences. Finally, the bill goes back to the Governor who can line item veto any provision in the budget. The line item veto can then be overridden by the legislature. Sounds complicated, doesn't it? In Part One, we'll discuss the Governor's budget proposal and what it means to the Worthington School District. The state budget primarily concerns itself with money. HB153 impacts Worthington in 4 ways. First, the federal stimulus dollars are not replaced. Worthington’s current budget (five year forecast) did not include a replacement for those dollars. In fact, Worthington was very smart to preserve, to the extent possible, the Edujobs money it received from federal government in 2010. Second, the state foundation was reduced from $13,775,064 to 12,357,372, a loss of 10.29%. The Treasurer had forecasted a loss of 10% so this was no big surprise. In fact, if the FY13 number (an increase of 4%) happens, we’ll do slightly better than what was in the forecast. Worthington’s loss in foundation dollars is a result of a temporary provision in the state budget that starts with FY11 funding and applies a multiplier based on property valuation. The higher the valuation, the less money a district would receive from the state. This is quoted from the LSC analysis. The bill enacts a temporary formula to fund schools for the biennium in anticipation of a permanent system to replace the EBM. Under that formula, the Department of Education must compute and pay each city, exempted village, and local school district, for fiscal years 2012 and 2013, an amount based on the district's per pupil amount of funding paid for fiscal year 2011 adjusted by its share of a statewide per pupil adjustment amount that is indexed by the district's relative tax valuation per pupil. The statewide per pupil adjustment amount must be determined by the Department so that the state's total formula aid obligation to school districts does not exceed the aggregate appropriated amount. This has a number of interesting side effects. The Kasich budget does not mention the transitional aid guarantee. The guarantee has provided Worthington flat funding for over a decade despite declining enrollment. We were concerned that if the guarantee was eliminated, Worthington would suffer deep declines (essentially, a decade of accumulated enrollment decline) but because the new budget used the old budget as a base, we won’t suffer from the loss of the guarantee. The problem that Worthington has with the budget’s philosophy is that it still uses property valuation as a measure of district wealth, and the wealthier the district, the less state funding you received. While Worthington might have high property wealth, the income levels of school district residents have been declining for a long time now, meaning that many residents are house rich, cash poor. A better metric might be to use median income as a barometer for district wealth. Note that every state budget has used property wealth to effect a robin hood redistribution so Governor Kasich’s budget is not out of the ordinary in that respect. contains the OBM spreadsheet that concerns foundation payments, including the percentage loss in foundation from FY11 to FY12. Worthington seems to have suffered more than most, but in our area, Dublin, Upper Arlington and Olentangy took much larger percentage hits to foundation funding. To put this into context, one has to realize that the state constitution only allows you to budget two years at a time. Sure, politicians make long range plans all the time, but the musings of one general assembly are not binding on the next. In 2005, Governor Taft eliminated the tax on Tangible Personal Property Tax on Business. The tax was burdensome and Ohio was one of the few states that had it. The problem was - the tax was not a state tax, it was a local tax. Of course, business didn't care whose hands were in the corporate cash register, all they knew is that they had a business expense. Governor Taft eliminated the tax and replaced it with the Commercial Activity Tax. Unlike the TPP tax, the CAT tax is at the statewide level. Essentially then, the state replaced a local tax which Worthington Schools benefited from with a statewide tax which Worthington Schools did not benefit from. To make that change easier on school districts across the state, Governor Taft promised that school districts would be held harmless (meaning, they would get the exact amount they would otherwise lose) until 2011 and then gradually, the tax reimbursements would be phased out, presumably after the schools had a chance to adapt to no longer having that revenue source. The problem is, Governor Strickland, the Ohio House and the Ohio Senate had no more control over extending the TPP than you or I did. One general assembly cannot mandate what the next general assembly does. Fast forward to 2011. The state of Ohio is broke, Governor Kasich is elected and he needs to solve a 4 billion dollar budget problem (the 8 billion dollars that everyone talks about is for 2 years). To help solve the problem, Governor Kasich elects to stop reimbursing school districts for their losses that stemmed from Governor Tafts decision to eliminate the business tangible tax in 2006. The Kasich budget treats TPP reimbursement like this. For any district whose TPP reimbursement was less than 2% of its total revenue, the new TPP reimbursement is zero. For all other districts, the FY12 TPP reimbursement is defined as FY11 TPP reimbursement – (2% of total revenue). This formula will be maintained until your TPP reimbursement falls below 2% in which case, it is eliminated entirely. This chart shows the progression of Worthington's expectations for FY12 and FY13 over the years. After the state budget was passed in 2007, we expected we would receive around 12 million dollars in 2012 and around 10 million dollars in 2013. After the state budget was passed in 2009 and based on the promises of the general assembly and Governor Strickland at the time, we expected we would receive around 15 million dollars in both FY12 and FY13. Governor Kasich's budget takes us back to around 12.5 million dollars in FY12 and 9.7 million in FY13 which is not as good as where we were before, but better than we were in 2007. Does this hurt Worthington disproportionately? In a way, no, because it treats all districts the same with regard to the TPP reimbursement phase-out, however, it absolutely destroys those districts that were dependent on the tangible personal property tax in the first place. No one believed that this money was ever going to be phased out, so no one prepared for it. The temporary reprieve offered by Governor Strickland lent credence to the notion that eventually, this money would be reimbursed permanently or a funding system would be put in place so that it didn't matter any more. The bottom line is that Worthington will lose 15,000,000/year between now and 2022. The 15,000,000 figure works out to a new 8.33 mill levy to make up the difference. I have to give kudos to Worthington CFO Jeff McCuen who noted in his last forecast that the state had not identified a revenue source to pay for the reimbursement promised by the legislature. 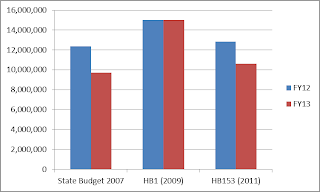 He was right - there was no pot of gold waiting in 2011 and Governor Kasich's budget reflects that fiscal reality. The Governor's budget includes a controversial provision that decreases the taxpayer percentage of pensions from 14% of salary to 12% of salary. In Worthington, this works out to 1.5 Million dollars in FY12. To put this into perspective, this opportunity for savings is more than the loss of state foundation money. Some organizations have pointed out that this provision would knock the pension funds off the road back to fiscal solvency. Others have argued that it is simply unfair to change the burden on public employees. Stay tuned to see if this provision survives the legislative process. Worthington is slammed by the budget, but I don’t think an objective view would say that we were disproportionately slammed. Governor Kasich wanted to protect funding for districts reliant on the state and he wanted to use CAT tax money to balance the general fund and he accomplished those objectives. Worthington and other districts can argue the morality of the TPP Phase Out (replacing a local tax with a state tax and then eliminating the reimbursement) but that discussion was held in 2006. All this budget does is speed up the process by 2 years. I will continue to push so that Worthington gets its fair share of state funding, but I think our better shot at relief will come from the elimination of state mandates and a roll back of some of the charter school provisions that fund state scholarship programs with local taxpayer dollars.